CALGARY, Canada (April 9, 2018)—Jon Harris, a London-based project management veteran with extensive experience in the natural resources sector, has joined Pennine Petroleum Corporation (TSX-Venture: PNN) (“Pennine” or the “Corporation”), effective immediately, as a Non-Executive Director. Mr. Harris has served as a Non-Executive Director for several AIM- and TSX-listed companies, including Bankers Petroleum Ltd., which pioneered Albania’s Patos-Marinza heavy oil fields, from 2004 through 2016. He also has experience in leading two AIM listings for clients in the past decade. CALGARY, ALBERTA (February 6, 2018) – Pennine Petroleum Corporation (TSX-Venture: PNN) (“Pennine” or the “Corporation”) has been moving rapidly over the past month to establish a drilling bid framework for its earning well No. 1 in Albania’s Velca Block. Carey Chilliak, who was appointed Pennine’s Vice President of Operations, Albania on Jan. 3, 2018, has created a tender process that aligns with terms of the Velca Block Production Sharing Agreement (“PSA”), and provides abundant transparency to satisfy local audits. Mr. Chilliak is well known among local and European suppliers and contractors, and has been engaging in preliminary discussions with reputable drilling equipment suppliers—particularly drilling rig contractors and well service providers. CALGARY, Alberta (January 3, 2018)—Pennine Petroleum Corporation (“Pennine” or the “Corporation”) (TSX-V: PNN) is pleased to announce that Carey Chilliak has been appointed as Pennine’s Vice President of Operations, Albania, effective Jan. 1, 2018. Mr. Chilliak will provide leadership, business continuity, communication and transparency to all business units and transactions to fulfil Pennine’s activities in Albania, while also ensuring rigorous Supply Chain Management (SCM) discipline and ethics. CALGARY, ALBERTA (November 23, 2017) – Pennine Petroleum Corporation (TSX-Venture: PNN) (“Pennine” or the “Corporation”) is pleased to announce the receipt of final approval of a Production Sharing Agreement (“PSA”) for research, development and production of hydrocarbons in Albania’s Velca Block. integrate the data with previously collected geological information. CALGARY, Alberta (October 23, 2017)—Pennine Petroleum Corporation (“Pennine” or the “Corporation”) (TSX-V: PNN) is pleased to report that its five current Directors have been re-elected for another term, following Pennine’s annual and special meeting of shareholders held October 23, 2017. N. Desmond Smith, Richard Wadsworth, Jeff Saxinger, Ray Gertz and Harry Sargeant IV all received at least 99.91% of the votes cast by Pennine’s shareholders. CALGARY, ALBERTA (July 11, 2017) – Pennine Petroleum Corporation (TSX-Venture: PNN) (“Pennine” or the “Corporation”) is pleased to announce the appointment of Ms. Connie Kuhl to its advisory board. Ms. Kuhl, based near Dallas, Texas, previously served as Senior Vice President of E*TRADE Financial (“E*TRADE”), a New York-based financial services company for self-directed investors, and was responsible for developing E*TRADE’s customer service, operations and trading activities. She was also the former Chief Compliance Officer and Senior Vice President of Customer Service and Brokerage Operations for Motif Investing, a next-generation online broker. 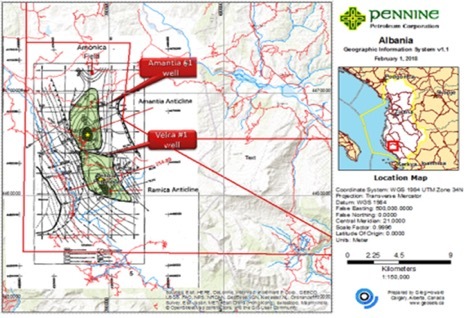 CALGARY, ALBERTA (May 2, 2017) – Pennine Petroleum Corporation (TSX-Venture: PNN) (“Pennine” or the “Corporation”) is pleased to announce the completion of the Resource Estimate Velca Block, Central Albania, (“Technical Report”) prepared by Apex Energy Consultants Inc. (“Apex”), in accordance with National Instrument 51-101 - Standards of Disclosure for Oil and Gas Activities and the Canadian Oil and Gas Evaluation Handbook. Apex is an independent qualified reserves evaluator with offices located in Calgary, Alberta. In summary, the Prospective Resource Report identifies a Best Case recoverable resource of 26,400,000 barrels of oil providing a Pennine Net Risked Prospective Resource of 11,200,000 barrels of Oil as to its net working interest (after payout and joint venture interests). Further the Report states that after a Chance of Discovery of 43%, the Pennine Net Risked Prospective Resource is 4,874,000 barrels of Oil.